On the PC, on the TV or on the go, DivX video offers a truly cinematic media experience that&rsquo;s as flexible as your life demands. Don&rsquo;t let yourself be tied to just one screen. DivX lets you enjoy your media wherever you want. DivX Mobile products give you a high-quality DivX media experience in the palm of your hand. Enjoy your movies, video clips and tv shows absolutely anywhere with a DivX Certified or DivX-compatible mobile phone. Even if your phone isn&rsquo;t officially DivX Certified, you may still be able to watch DivX videos on your phone by installing the DivX Mobile Player. find out below if your phone supports the DivX Mobile Player, then follow the link to download it from DivX Labs. Note: You will need to log in to your DivX Labs account and subscribe to the DivX Mobile community to download the DivX Mobile Player. Don&rsquo;t have a DivX Labs account? Create one. 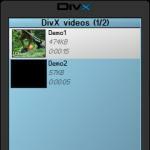 DivX Mobile Player For Windows..